At first glance, the Soviet government's policy on language and literacy in Azerbaijan seemed self-defeating. The Soviets organized literacy classes in the late 1920s to teach people to read the Latin alphabet, replacing the Arabic script, which had been used for nearly 13 centuries. Then in 1939, less than ten years later, they switched to Cyrillic. Literary critic Kamal Talibzade (1923- ) explains that this seemingly bewildering strategy was anything but accidental. Rather, it was highly calculated and well orchestrated. First of all, they did it to reduce the power of Islam in the region and then to prevent the Soviet Turkic republics (Kazakhstan, Turkmenistan, Uzbekistan, Kyrgyzstan and other smaller Turkic-speaking nations within Russia like the Tatars) from forming alliances among themselves and with Turkey, which might challenge Soviet sovereignty. Not surprisingly, when the Soviet Union collapsed and Azerbaijan gained its independence in 1991, one of the first laws passed in Parliament [December 25, 1991] was the adoption of a modified Latin script as the national alphabet. 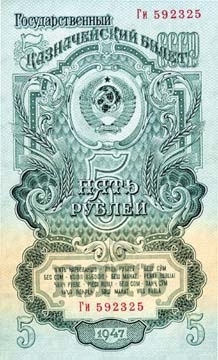 The script that was chosen was similar to the one used before the Cyrillic alphabet was imposed in 1939. In the late 1920s, there was a great push to stamp out illiteracy in Azerbaijan. A modified Arabic alphabet (based on the Persian script) had been in effect since the Arabs conquered the region in the 7th century. 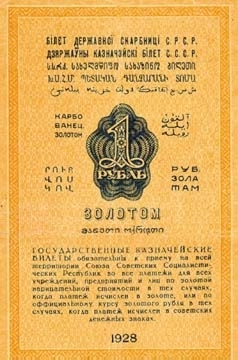 During the Oil Boom period in the early 1900s, there had been considerable discussion about whether to modify the Arabic script so that it more closely suited the nuances of the Azerbaijani language or to opt for a totally new script - Latin. The Soviets were quick to see that by prohibiting the Arabic script, they would be able to diminish the grip of Islam on the region. 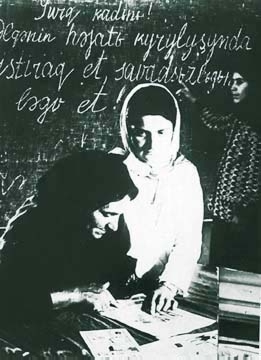 Left: An Azerbaijani woman learns the new Azeri Latin script at the school of Elimination of Illiteracy, 1930. The blackboard reads: "Turkish woman! Participate in building the life of the country, eliminate illiteracy." Photo: National Archives. I was born in 1923, three years after the Bolsheviks set foot in Azerbaijan. I still remember how the literacy campaigns were conducted up through 1929 and 1930. Our neighbor's grandmother was about 80 years old at the time. Someone went to her home to recruit her for the literacy campaign so that she could learn to read the new Latin script. But, of course, the old woman had no interest - it was too difficult for her. One of her relatives told her, "You can't go against the decisions of the Soviet government. You'll have to learn to read and write. Otherwise, they'll make you sit on eggs and hatch chickens." Well, of course the guy was joking - well, somewhat, though there was an inkling of truth in what he said. During the Soviet period, we soon discovered that we could not counter the decisions of the government, so we simply learned to submit to them. Of course, it wasn't compulsory for elderly women to learn to read the new Latin script. But kids had no choice; they had to go to school. One should be frank, though, when it comes to education under the Soviet system. The government's literacy campaign was quite progressive for its time and played a significant role in the emancipation of Eastern Muslim women. Many of them, previously confined to their homes, did learn to read, and many went on to become teachers themselves. Eventually, 98 percent of our population became literate, surpassing many of the most advanced countries in the world. My mother, Shahzade khanim, was very involved in the literacy campaign. She had studied at a Muslim religious school - a madrasa - in Derbent, a city on the Caspian shores, north of Azerbaijan and now part of Dagestan, Russia. She already knew how to read the Arabic script and was eager to learn Latin as well. She was 26 years old at the time. My father, Abdulla Shaig, was a progressive man and a teacher and writer himself, so he was very supportive of her efforts. 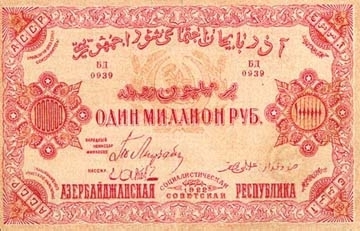 Above, below left and right: Ruble notes showing Azeri Cyrillic (1947) as well as Azeri Arabic scripts (1928) used in Soviet Azerbaijan. Courtesy: Yagub Karimov. My mother attended classes every day at the Women's Club, the residence that the Bolsheviks had confiscated from the oil baron Mukhtarov. Today, this palatial building functions as Baku's major "Wedding Palace". Although the Club was quite a distance from our house, Mom rarely missed class. Soon she was reading fluently. I remember that her favorite novels included Victor Hugo's "Les Misérables" and Rashad Nuri Guntekin's "Chaligushu" (The Wren). 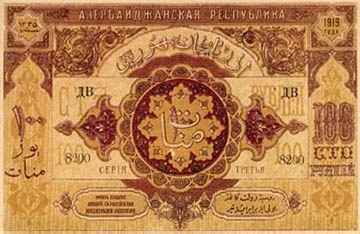 Photos below: Currency used in Soviet Azerbaijan during various time periods, reflecting the changes in scripts from Azeri Arabic to Azeri Latin, early 20th century. Courtesy: Yagub Karimov. The Soviet campaign against women wearing the chador [veil] was organized hand-in-hand with the literacy campaign. The process itself was called "Doloy Chadra!" In Russian "doloy" means "down with", as in, "Down with Chadors!" or "Off with Chadors!" Newspaper articles and banners published slogans discouraging "progressive" women of the Soviet Union from being "backward" and wearing veils. Of course, without a veil it was difficult for them to practice being devout Moslems. But women throughout Azerbaijan, for the most part, embraced the idea and shed their chadors as if they had been waiting to do so for a long time. Jafar Jabbarli's play "Sevil", staged in 1928, depicted its heroine as taking control of her own destiny and taking off her veil. Many women attended the theater that season. Many are said to have left the theater no longer wearing veils - they had courageously decided to take them off. The process of shedding the chador extended over a period of about seven to eight years. You have to remember that prior to this period, Baku was a city where no woman went out on the street unescorted. So changing the dress code was a major decision. In our family, however, taking off the chador was not such a big deal. We were good friends with the poets Ahmad Javad and Husein Javid and their families. They looked favorably on such a change and didn't see it as a problem. Other families in our district of Verkhny Nagorny were more conservative and insisted that the women wear their chadors for the rest of their lives. This was also the case in Baku's Inner City (Ichari Shahar). 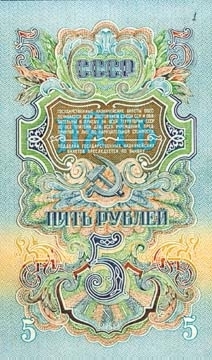 The new Latin script was soon viewed as a threat to the sovereignty of the Soviet government. Of course, Azerbaijanis had been considering adopting a modified Latin alphabet long before it became official. In 1926, Baku hosted the First International Turkology Congress to promote the universal acceptance of a Latin script among all Turkic-speaking nations. By 1930, all of the Soviet Turkic republics had adopted some form of the Latin alphabet. 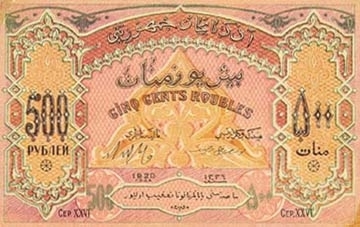 Turkey made the change to the Latin alphabet in 1928. Stalin seems not to have anticipated that Turkey would give up the Arabic script. Since the majority of nations gathered under the Soviet umbrella were of Turkic origin, he soon feared that the alphabet might become a consolidating factor to unify these nationalities against him. As fate would have it, those who showed the most enthusiasm for universal acceptance of Latin at Baku's Congress became victims of Stalin's repression starting in 1937. They were among the first to be arrested, sent off to exile or executed. Their crime: "Pan-Turkism". My father, Abdulla Shaig, directed a school in Baku and had invited teachers to come from Turkey, but the school was closed down and my father was sent to teach in Shusha, one of the major centers in mountainous Karabakh. Had he remained in Baku, no doubt he would have been among those first victims of Stalin's suspicion and wrath. So in 1940, Stalin made it mandatory for all the Turkic republics of the Soviet Union to adopt Cyrillic. Georgia and Armenia, however, were allowed to keep their original alphabet. Stalin was a Georgian, and one of his closest advisors - Mikoyan - was Armenian. All Turkic republics were given the right to configure their own alphabet in relationship to the sounds that were not found in Russian but were indigenous to their own language. But this lack of state coordination resulted in similar Turkish sounds being represented by different symbols. From then onwards, we were not able to read each other's texts because critical sounds, especially the vowels, were written differently. It meant that we Azerbaijanis were no longer able to read anything written in Uzbeki1, Turkmen, Bashkirian or Chuvashi, even though our languages are fairly closely related. It was a clever move on the part of the Soviets. It further squelched any attempts at unification among the Turkic nations. I have to confess that to me the Cyrillic alphabet is one of the ugliest and least practical alphabets. Look at its letters. So many of them are alike ("sh," "i", "m", "t") and when they follow sequentially, it's hard to figure out the word. Changing the alphabet again - this time to Cyrillic - brought major confusion, not just to the children studying in schools. It was done to sabotage and undermine the Turkic republics. Millions of people simply could not read the new alphabet. It's not easy for a middle-aged person who is used to one alphabet to have to start all over and learn a new one. That's exactly the same situation that we face today, now that the alphabet has been changed back to Latin. It takes time. You can't just change an alphabet overnight. Of course, these days, economic factors have compounded the problems of introducing a new alphabet. We're going through a major transitional period. It's not that we didn't have economic difficulties during the Soviet period. It was a lie that people were living happily without a single care under the Soviet regime. I remember my father holding down three or four jobs just to earn enough money. Each time the alphabet changed, part of our literary heritage was lost. When we adopted Latin the first time, the literary heritage of Arabic was lost. With the introduction of Cyrillic, the heritage of Latin was lost, even though it was only official for about ten years. And now again, it won't be long before books that have been published in Cyrillic will no longer be read either. This is one of the problems that we'll have to deal with. All of my books as a literary critic have been published in Cyrillic. Within five years or so, the younger generation won't be able to read my books. Sometimes I think: "What a pity! I've been serving this society as a scholar for 55 years. But none of my books will even be readable in the future." These days, kids know both alphabets - Cyrillic and Latin. But within five years' time, that won't be the case. I'm still convinced, however, that we made the right decision to embrace Latin. Our future is the main issue. I'm among the happiest people in the world because I've seen the collapse of the Soviet Union with my own eyes. Of course, it's difficult to get used to things like a market economy and new trends in society. But I am no longer a slave. I'm my own master. Now I can breathe freely. I have a photo of my parents with tears welling up in their eyes while they were listening to the announcement of Stalin's death  on the radio. But I was glad when that day came, even though I'm a sympathetic person by nature. It's important for us to adopt the Latin alphabet. A common alphabet will bring us together with the other Turkic peoples. It will give us a national identity. It will let us integrate into the larger international community more easily. The Latin alphabet will lead us in the direction that we want to go in history. The Cyrillic alphabet was imposed on us by Soviet totalitarianism, and we needed to get rid of it. Some people in the government are still against Latin. Some of them seem to be waiting for the day when the policy will be reversed, and Cyrillic will reign again. Frankly speaking, I think that's one of the main reasons why the process of adopting our new alphabet has been so slow. As for me, I'm comfortable with all of the scripts. During childhood I learned the Arabic script from my parents. Then during my early school years, I studied Latin. My scholarly work was published in Cyrillic. Believe it or not, I still use the Arabic script for research, because I deal with Azerbaijan's classic literature. And now we're back to a slightly different version of Latin. So there you have it - four scripts - and all within my very own lifetime. 1 Uzbeki is the Turkic language spoken in the newly independent Republic of Uzbekistan, which also has adopted a Latin alphabet since independence from the Soviet Union. Bashkirian is the Turkic language of the Bashkirs, whose main city is Ufa, close to Tatarstan in Russia. Chuvashi is the Turkic language of the Chuvash, a nation in Siberia. Kamal Talibzade, one of Azerbaijan's more famous literary critics, was interviewed by Jala Garibova. His article, "Transitions: Literary Criticism in Azerbaijan ­ A New Look at Soviet Works," appeared in AI 4:1, Spring 1996.